Medal of Honor: Warfighter was supposed to be the big military shooter of the fall. Or at least, of the fall until that other big military shooter comes out in a few weeks. 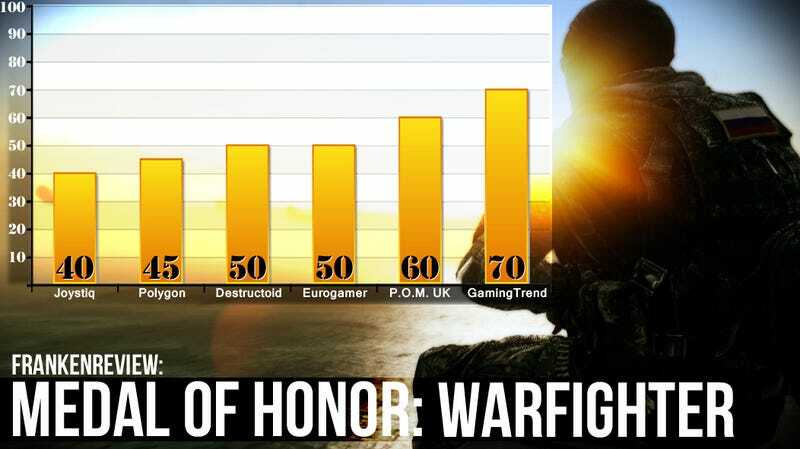 Comparisons between Medal of Honor: Warfighter and its competitors, Call of Duty and Battlefield, have proven inevitable—and Warfighter does not fare well in the comparison. Opinions run the gamut, from "uninspired" to "awful," but never actually make it up to "good." Will more post-launch multiplayer change hearts and minds? It's not looking good. Perhaps the silver lining in a bad game is that it can produce excellent writing. Read on to find what reviewers 'round the world made of the muddled mess. It's impossible not to compare Medal of Honor: Warfighter to the Call of Duty franchise, the series that dominates the genre and so clearly serves as an inspiration for Warfighter's large-scale moments. While the Call of Duty series has shown solid and creative iterations year-after-year, building upon its core foundation with interesting additions, the sum of Medal of Honor: Warfighter's parts instead comes off as an estimation of what a shooter must have to be considered competent. Danger Close purports to have nobler goals than just another war story. It's talked at length about their quest for authenticity, if not realism. Very little of it shows in the final product. Medal of Honor Warfighter fails in almost every regard. Warfighter's campaign is a jumble of flashy parts that Danger Close unsuccessfully tries to glue together, and the solid foundation of its multiplayer is buried under a broken interface, small maps and poor interface design. Charmless, cynical, and uninspired, Warfighter encapsulates everything wrong with the annual big budget shooter industry. It's really not an awful game, it's just insipid and shallow, a title that exists solely to exist, and squeeze whatever profit remains to be had from serving the same flavorless porridge to the same unadventurous customers. It will make its money, and keep the FPS factories in business for another year. Outside of a few thrilling (but out-of-place) car chase sequences that would feel more at home in a James Bond or Jason Bourne game, Warfighter brings nothing new to the table. The level design is painfully linear, and Danger Close puts a strange over-emphasis on breaching techniques. The laughable enemy AI is prone to taking cover from grenades in the middle of the street, and your oblivious squad members set up shop in your line of sight or even push you out of cover because they are scripted to position themselves in that spot. The occasional audio glitches, ugly building textures, and awkward lighting choices prove Danger Close isn't comfortable controlling the powerful Frostbite 2 engine, as well. I even experienced a checkpoint bug that forced me to restart an entire level. That Medal of Honor: Warfighter is utterly generic and devoid of personality doesn't come as much of a surprise. Clearly dusted off to fill the years when DICE can't provide EA with a new Battlefield game, Medal of Honor's rebirth as a khaki placeholder is now complete. This is not a game that seeks to challenge or innovate. It's here to give you exactly what you expect and nothing more. Yet even when following in the footsteps of others, it can't help tripping over its own boots. Warfighter is at best competent. A slightly damning indictment meaning that at its highest shooty peaks this is basically average. And a five-year-old average at that, with dialogue and gameplay that crib so hard from the Modern Warfare/Generation Kill school of American foreign policy that it touches down somewhere between parody and homage. Apparently this season's way to talk in armyland is to call everyone "brother". Roger? Over. Review actual. Hard copy, out. I don't know which General Officer Bright Idea thought it was a good idea to rush this game (I'm sure it has everything to do with the timing of another upcoming military shooter) but the experience has suffered for it. While some little things like having to account for bullet drop compensation (BDC) while sniping, the inclusion of a HUD color blindness mode, excellent voice acting, the ability to lean, and a very solid driving level makes for a compelling product, the fractured and seemingly random storyline and currently-busted multiplayer can't be ignored. Danger Close has a short window to get themselves squared away before it's too late. Medal of Honor's reboot in 2010 was high speed, low drag, but this year's title just feels like a rush job – a little 6P (Proper Planning Prevents Piss Poor Performance) could have gone a long way.